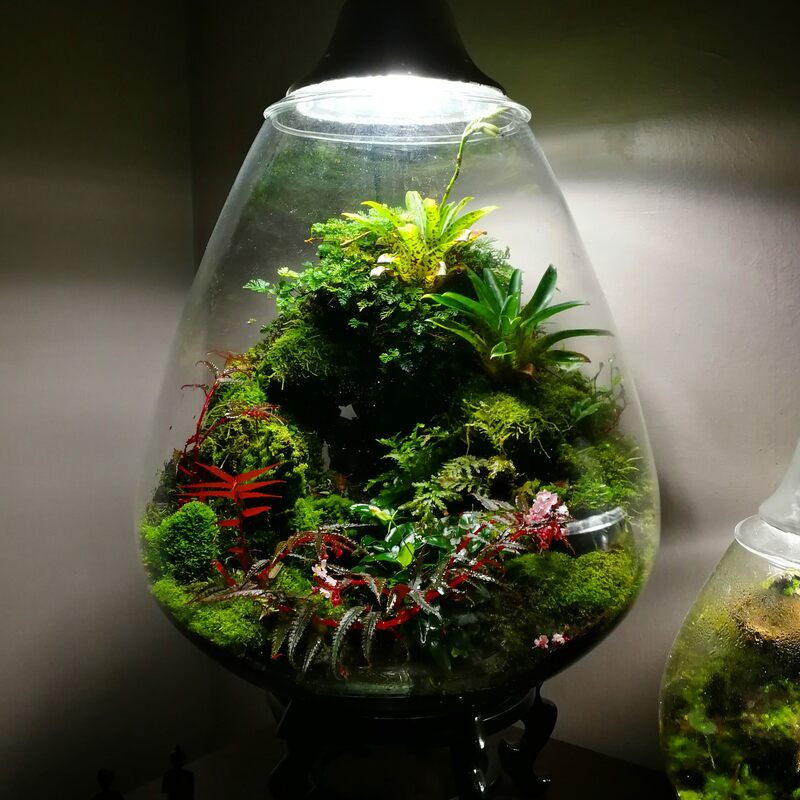 Discussion in 'Vivariums and Terrariums' started by AbraxasComplex, Oct 1, 2018. So it's been nearly two years and my Lava Rock Grotto terrarium has started growing on me. It houses a group of Phyrnus marginemaculatus. For lighting I use a 13 W 6500K Philips brand CFL. As for plants I use Anubias nana 'petite', Davallia repens, Davallia parvula, Vriesea racinae, Crepidomanes minutum, Begonia pteridiformis 'red form', Corybas pictus, various Ricardia and Ricca, Bulbophyllum alagense "small form", a Trichomanes sp., and a bunch of different filmy ferns I forgot to keep track of. Also have a mini Bucephalandra in the water feature. That's such an awesome enclosure! How many Phrynus do you have in there? Honestly? Not sure. The first generation were all old adults and have passed on. Their offspring are in there and the most I've seen are 4 at a time and several are adult size bke. So there could be 4 to a dozen. Lots of room, but the tank is mostly about the plants anyway. Very nice! Do you add food for them or just let them eat the cleanup crew (assuming you have one in there)? I add crickets and fruit flies every 2 weeks. There is a clean-up crew as well. Not sure if they eat them. Cacti, tree aloe and South African bulb hobbyist here, so I get this.. high price tags due to slow growth and taking years or decades before first flowering and/or difficult propagation. $3 for a mature Boophone bulb? I don't think so...! "Well I get a bag of bulbs for a dollar at Home Depot! Three dollars is a lot for a bulb!" It's hard not to respond with a chirpy "good luck finding any available Boophone bulbs...."
I have enough self awareness to recognize planning, designing, collecting and growing out your setups is quite out of my realm. Especially at your level and to make them that pleasing to even look at a picture of. Much respect. Very nice display. I remember seeing the original and being impressed but the current phase is even better. That Begonia pteridiformis is stunning. Do you know what Brom that is up top? I was thinking Neoregelia until I noticed the inflorescence. Is it a little Vriesea rodigasiana? Thanks. It's actually Vriesea racinae. They stay pretty small.